The Essence Designer Eyebrow is a brow pencil with a brush that's for anyone and everyone to help give definition and shape or to fill in sparse brows. The Essence Eyebrow Pencil retails for £1.50. Each brow pencil is simply packaged in the colour of the pencil and comes with a handy brush within the top to help with grooming and blending out. As I mentioned above you can use this in two ways to either define the brows or to fill in any gaps you may have. I usually use the brush to groom my brows first then I define them by drawing in the shape I want to achieve as well as using the pencil to add tiny hair strokes in the areas that need a little more fullness. Lastly, you can use the brush again to blend out any harsh lines and you can even pop this in your handbag for on the go touch ups. With regards to how long-wearing they are, I would say the colour lasts a majority of the day just like any other brow pencil, however, if you want to ensure your brows are completely bulletproof, then I would go in with a little brow powder over the top and then something like the Essence Make Me Brow Eyebrow Gel Mascara to finish and set everything into place. The shelf life of the pencils is 36 months once opened. Wilko stores and online here. This is a lovely simple eyebrow pencil for the price if you want something that's easy, fuss-free and travel-friendly. 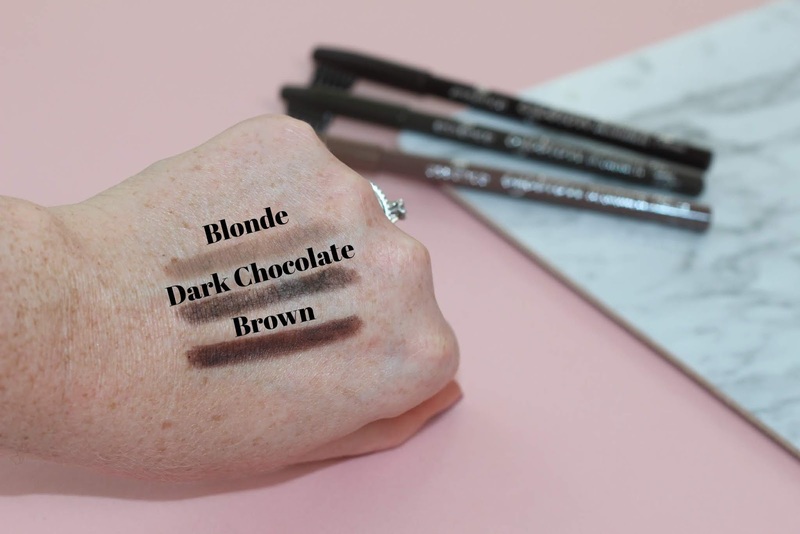 I love the fact that all the shades have a nice colour pay off without looking too harsh and you can even use two shades if you want to do more of an ombre brow as there is definitely a shade to suit most hair colours. As with any brow pencil, this does need sharpening to maintain the perfect point for drawing in the hairs but overall the Designer Eyebrow Pencil is ideal for any beginner out there who wants something that is affordable, easy to use and compact.